The work of Ben Penner, a frequent guest lecturer in geography and environmental studies courses at Gustavus, was featured in a recent StarTribune article. Ben directs the Open Arms farm at the Prairie Institute in Belle Plaine, MN. The farm produces organic produce for free distribution to persons living with life-threatening illnesses.Volunteers work on the farm and deliver the food to persons around the Twin Cities. Jory Birkeland, a Gustavus geography major, volunteered last summer after he learned about the non-profit organization in his Sustainable Cities geography course. The farm expects to deliver 30,000 pounds of produce during the 20012 growing season. The Prairie Oaks Institute is a non-profit retreat center and experiential learning facility centered on environmental stewardship and sustainable agriculture. Prairie Oaks Board members Kim Johnson-Devine and Chris Johnson were among the founders of the Institute and reside in Saint Peter. Ben Penner lives in Saint Peter and is married to Dr. Anna Versluis of the Gustavus geography department. 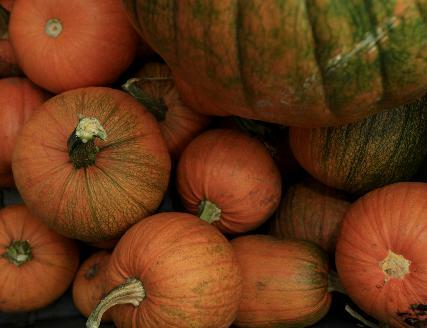 Pumpkins from the Open Arms farm in Belle Plaine, MN. Photo: StarTribune.